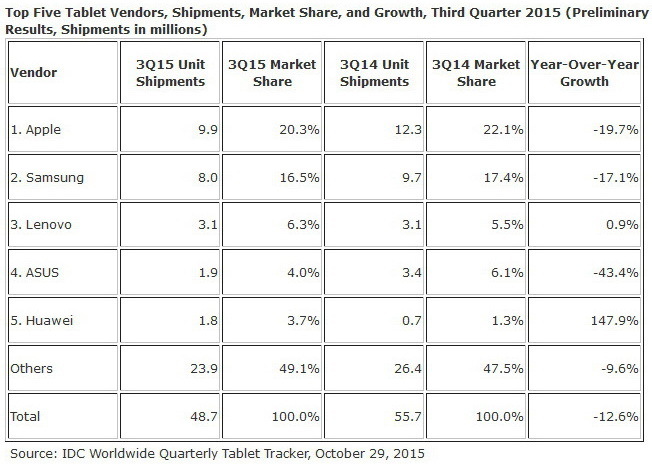 Global tablet shipments have declined for Q3 2015 by 12.6 percent. 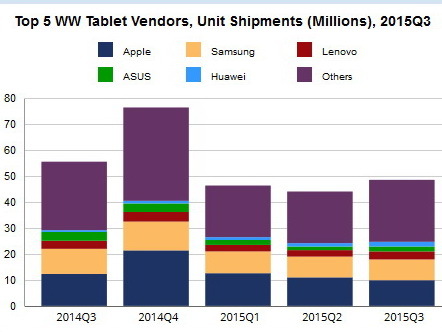 Despite some signs of improvement earlier in the year, the tablet market has shrunk this past quarter for Q3 2015. IDC has forecast 48.6 million units shipped globally representing a decline of 12.6 percent compared to Q2 2015. Numerous factors have attributed to the recent downward trend. For one, most consumers tend to keep their tablets for longer before upgrading by up to five years. Secondly, customers with intentions to purchase a new tablet would rather have a 2-in-1 detachable or convertible. Finally, prices are steadily declining for convertibles and detachables to make them more lucrative for buyers. Thus, IDC anticipates even lower "pure" tablet sales for the foreseeable future. The global top 5 list of tablet manufacturers paints a gloomy picture. YoY shipments have declined for most manufacturers with Asus being hit the hardest at -43.4 percent from 3.4 million units in Q3 2014 to just 1.9 million in Q3 2015. Huawei is the notable exception with an increase of 147.9 percent and has bumped itself up to 5th place as a result. The Chinese company is doing fantastically in the smartphone world as well. As for the others, Lenovo remained relatively stable at third place. Both Apple and Samsung experienced shipment declines by 19.7 percent and 17.1 percent YoY, respectively.